Storyteller Anne Glover instantly connected with participants who were excited to start exploring stories and make string figures. To get things started, Anne shared a tale about a cat stuck in a tree, while captivating the room by weaving and shaping brightly coloured string into figures. From a single string, she wowed participants as she created a tree, a cat, a snake, a turtle and a ladder to complete her story. 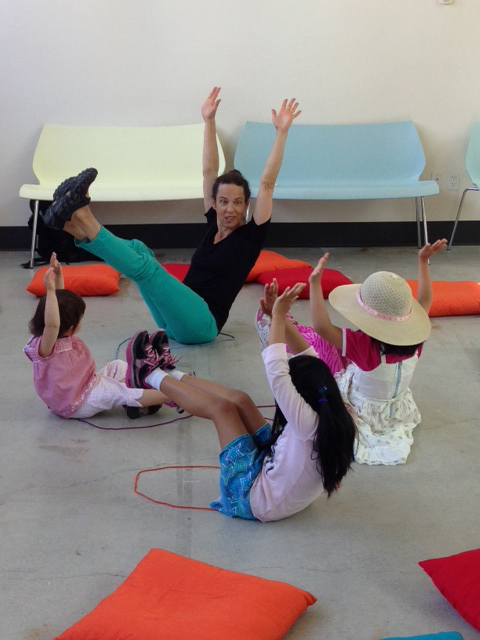 Encouraging hand-eye coordination and game play, Anne soon had participants connecting, collaborating and listening to each other's ideas to make new and hilarious imaginary characters and shapes. Next, it was the participants' turn to create new tales with a single loop of coloured string. 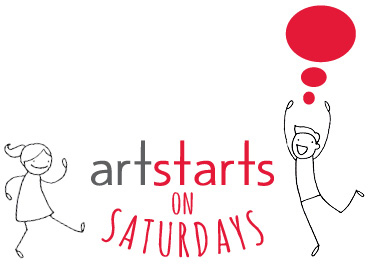 Children and parents made puddles, stars, roaring lions with whiskers, elephants, rocket ships and more! 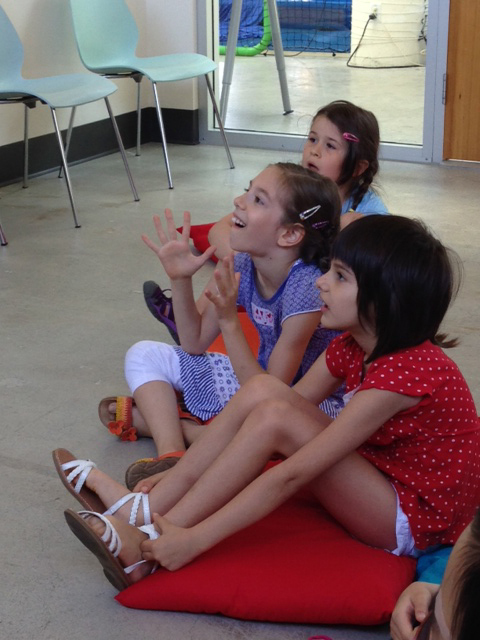 Incorporating French into their storytelling, participants also made a bridge — "Le Pont de Quebec" — then counted and played the cat's cradle game in French. Cat's cradle is played with a partner by wrapping string around your fingers in various patterns and is played by many cultures all around the world. 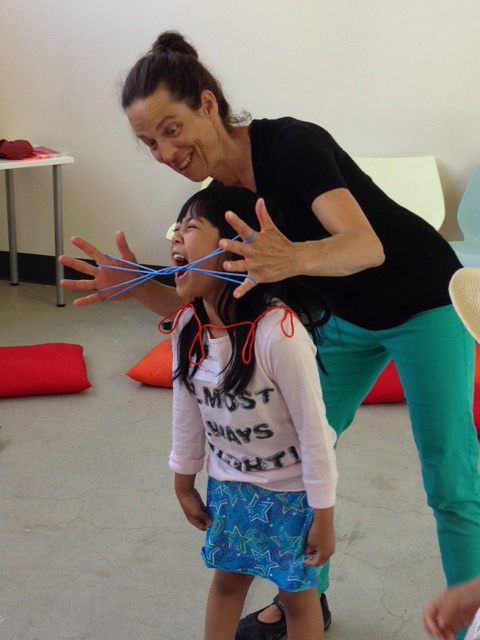 Anne explained that native cultures have been using string to tell stories and play for thousands of years! Next, she shared a special story of discovering the joy of string figures when she was in Grade 4. Her friend Betsy introduced her to string art during a Math class, and she showed her how to make cat's whiskers from string! 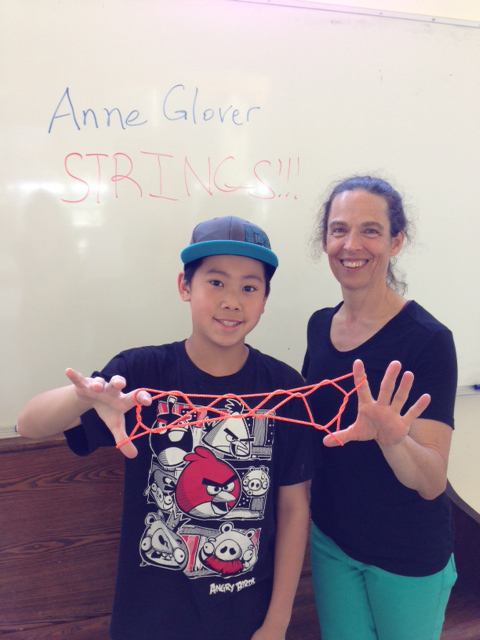 Anne was fascinated and has been practicing making string figures ever since. She also revealed that she made many "mistakes" when she first started learning how to make her string inventions. Anne reminded participants to stay positive, curious, look, study, and turn "mistakes" into exciting new inventions. Storytelling combined with string art can be an empowering and uplifting form of expression for all ages. Anne concluded her workshop by inviting participants to help her make a Jacob's ladder. 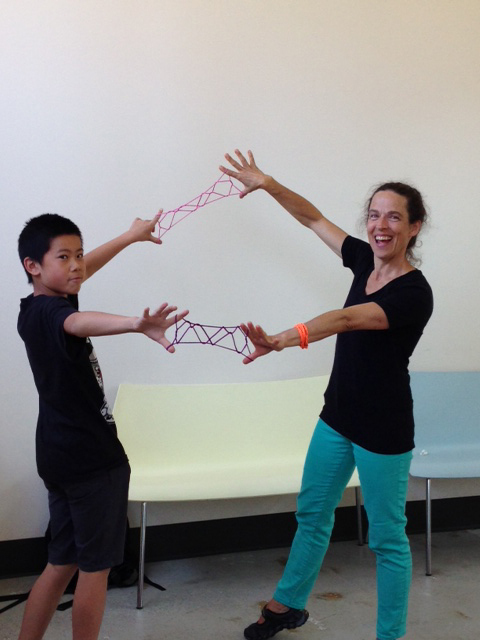 She encouraged participants to continue learning about string figures from additional resources such as books, websites — and most importantly, from grandparents! Thank you, Anne for a stimulating and captivating day! We hope to see you at our next workshops: Rainbow Rock Feltmaking with Kiki van der Heiden. 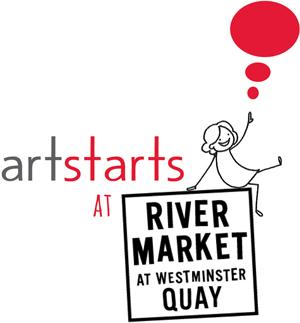 Join us at ArtStarts on Saturdays in Vancouver on Saturday, June 28 and at ArtStarts at River Market in New Westminster on Sunday, June 29. Read more details here.